The United States Botanic Garden (USBG) is located in DC on the Mall by the Capitol. 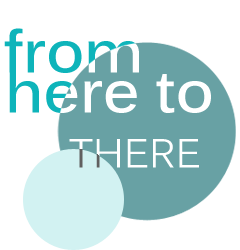 It’s a good walk … and it’s free! … and hot! Ya know, because I’m poor. And, ya know, because it’s chilly outside. Apparently there are three parts: the Conservatory, the National Garden, and Bartholdi Park. Saw the first two, but didn’t venture to the park because I didn’t know it existed until I checked Wikipedia later. Whups. The Conservatory (the enclosed building aka greenhouse aka what you probably think of when you picture the USBG) was built in 1933 by Lord & Burnham, and I gotta say I love the keystones on the entrance façade. 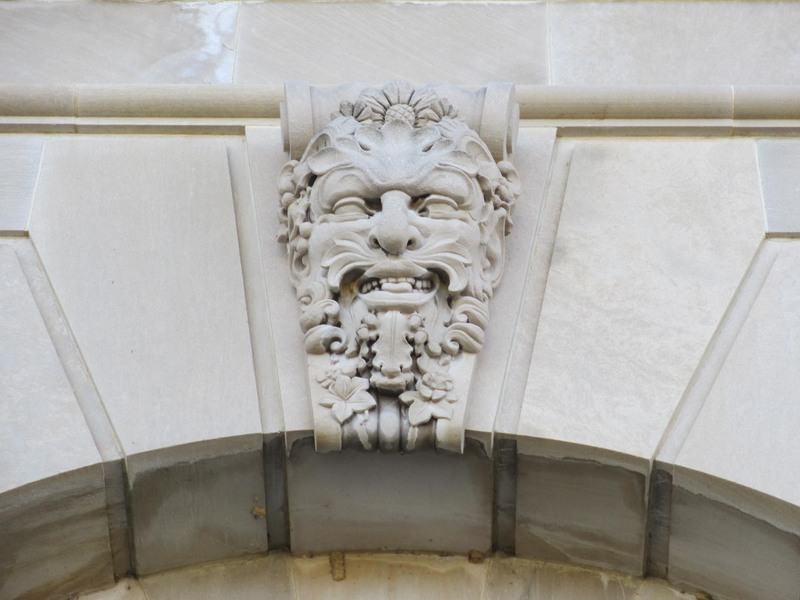 Each keystone has a different face and I just love those little flourishes of detailed ornament on solid Neoclassical architecture. It’s the little things that get me. 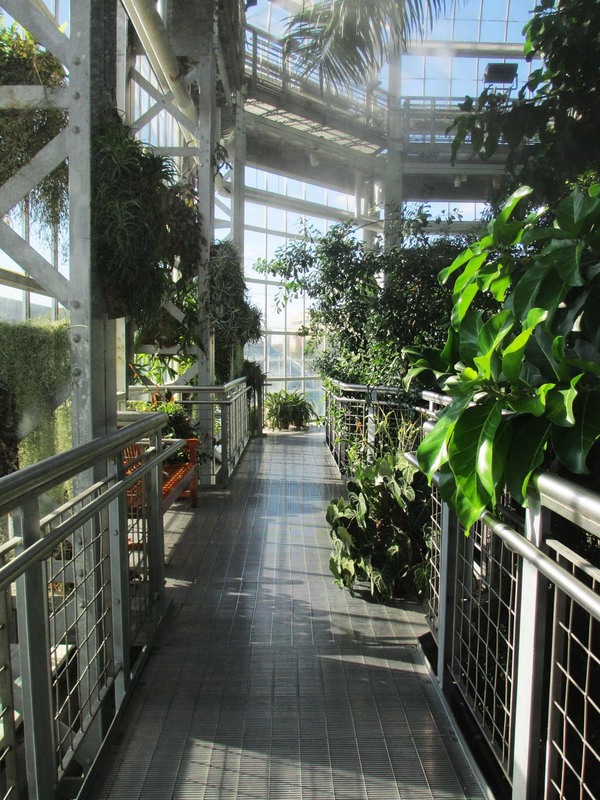 The main central space (which is called the Jungle) has an upper-level walkway, which provides a nice change of perspective … but be prepared to get a bit misted when they spray the plants. Oh, and if you have a coat, scarf, hat, and mittens (as you should if you’re in DC in the winter), be prepared to carry them through the gardens – because it’s a bit steamy in there! To be honest, I don’t know much about plants and I don’t really care all that much about learning about plants. But it sure is fun to look at ’em (well, some of them – some are just boring to look at). The USBG is much bigger than I thought it would be when I approached, since the Conservatory is fairly deep and has many different sections, and there’s also the entire outdoor garden (National Garden) adjacent to the conservatory. Unfortunately the National Garden isn’t heated and a lot of the plants looked a bit … lacking life. Nice way to kill some time and be reminded that the world isn’t all concrete and steel. 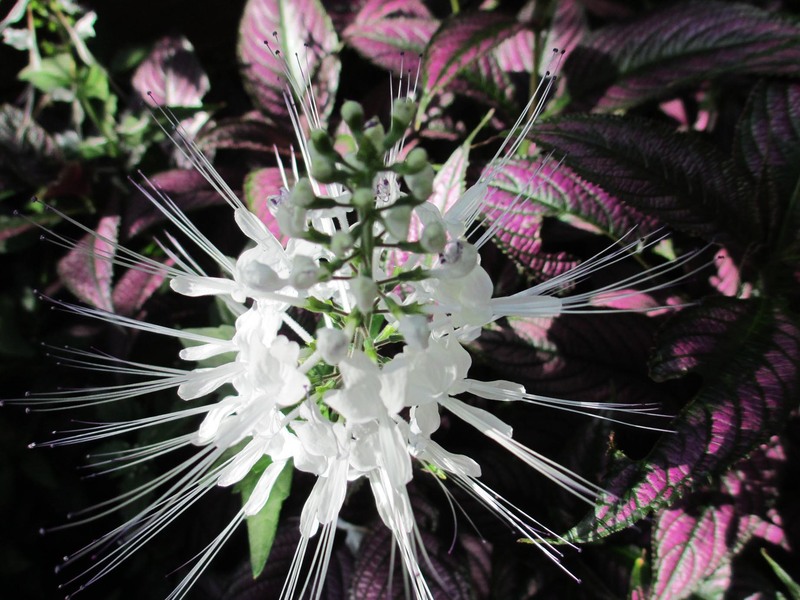 Plants – THEY’RE ALIVE! What is the difference between a monument and a memorial? A monument can be a memorial and a memorial can be a monument. Or can they? Take for example the Washington Monument and the Lincoln Memorial, on opposite ends of the reflecting pool in Washington, DC. Why is one a monument and the other a memorial? Each is in commemoration of a past president, each is a popular tourist destination, and each can be considered a visually-impressive work of formal art/architecture in its own right. 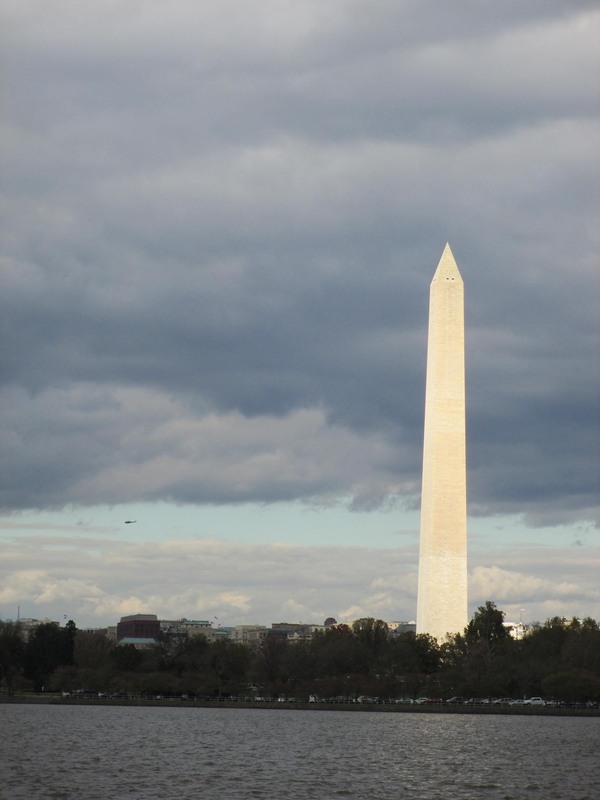 The Washington Monument is a monument to (in commemoration of) George Washington, 1st President of the United States. Washington is not represented via figural form. Instead his monument is an impressive stone obelisk. The Lincoln Memorial is a memorial to (in memory of) Abraham Lincoln, 16th President of the United States. 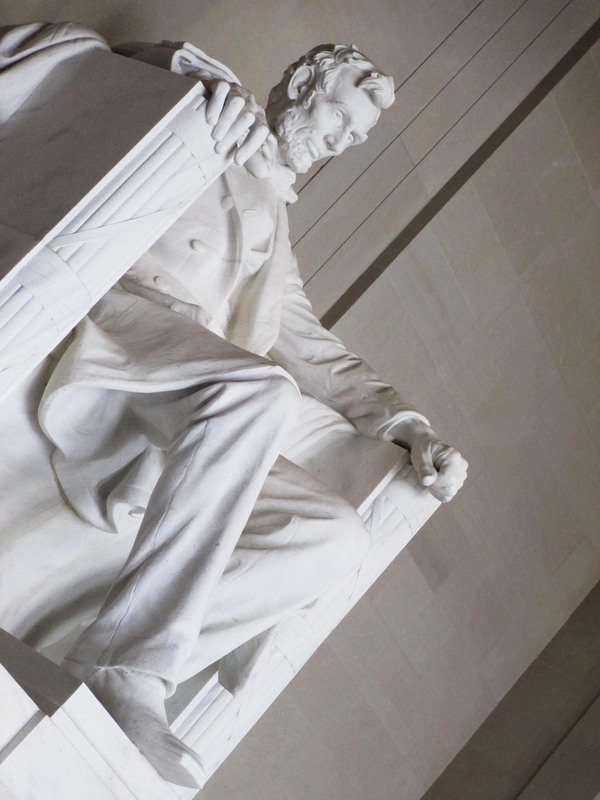 Inside is a larger than life-sized marble statue of a seated Lincoln, by the sculptor Daniel Chester French. 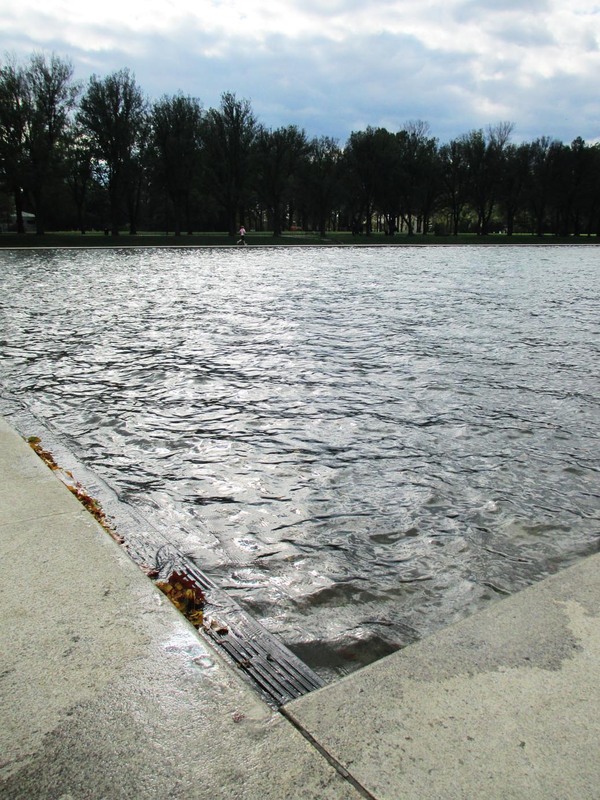 And then there’s the Reflecting Pool, which is technically part of the Lincoln Memorial, but whatever. Positioned between the two and reflecting both structures, it feels more neutral, favoring neither one nor the other. It might seem odd to add value judgments (better, more successful, prettier) to monuments/memorials, but let’s be honest … people visit them because they’re tourist attractions, not to remember the contributions of Washington or Lincoln. You could talk about the memorial aspect of the Washington Monument or the monumental aspect of the Lincoln Memorial, but they’re not called the Washington Memorial and Lincoln Monument simply because those aren’t their names. The way I always learned it, a monument is an architectural element and a memorial is a memory signifier. So while they may be the same actual object, whether you call that object a monument or memorial depends on what function of that object you’re describing or which takes precedence – the presence of form and physical architecture or the presence of history and transcendent memory. Is that clear? Hm … hope so. Do you know who David Hammons is? The contemporary African-American artist? The one whose sculpture is in the Hirshhorn’s permanent collection? Well, I didn’t. That is, not until I went to the Hirshhorn, saw this sculpture, and looked him up. 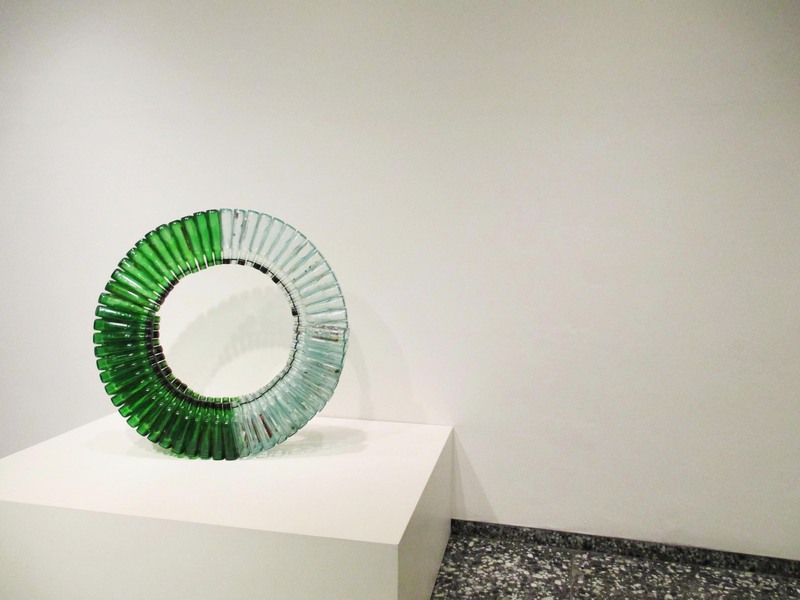 The sculpture is an untitled piece from 1989, made out of glass bottles and silicone glue. I thought it was pretty amazing. What could be more simple, more perfect than a circle? But then there are the components – the individual glass bottles – that are connected in a way that seems so natural and unforced given the shape of the bottles and the invisibility of the adhesive. A lot of his work deals with the civil rights movement from his heyday during the 1970s and 1980s. And though this particular sculpture has a distant, minimalist feel, it’s not. It’s not pure form, pure materiality, or pure object. It’s not a circle formed by the repetition of that particular angle; it’s actually a flattened spiral with slight irregularities. The glass is not clean and sterile; they are bottles of Night Train, a brand of bum/street wine. The sculpture is more than an object; it is a commentary on racial stereotypes, creating a sense of high art out of low trash. 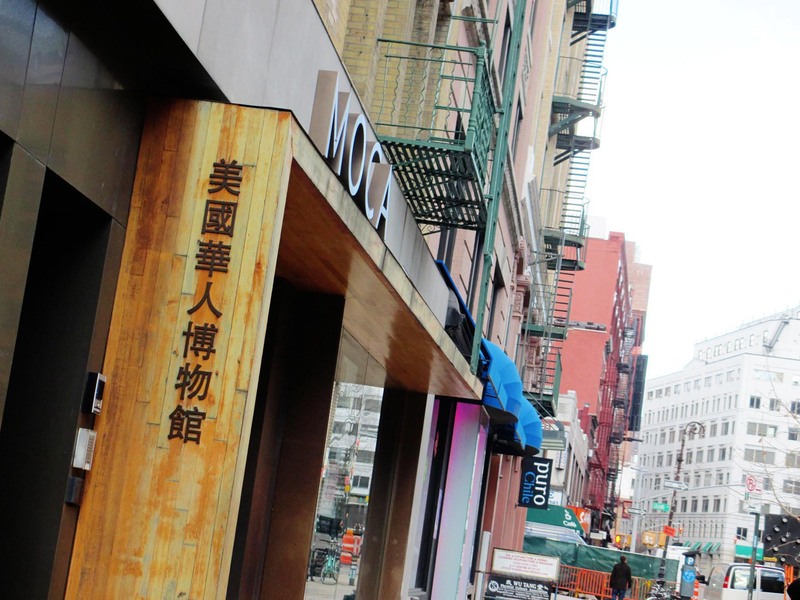 The Museum of China in America (MOCA) is located in the Chinatown section of downtown Manhattan. Yay Chinatown! One of my favorite places in this city! It’s located at 215 Centre, which isn’t really the heart of Chinatown, because the heart of Chinatown is already occupied by grocery stores and restaurants. 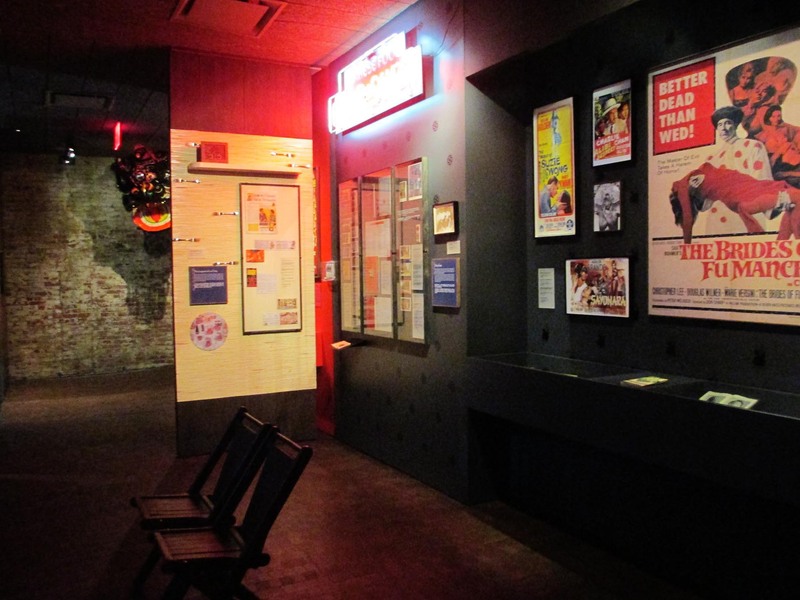 Inside, the main exhibit is kind of a homey feeling history gallery, which is separated into small rooms. The lighting is pretty dim and I guess they were going for the ‘experience’ setup as opposed to the ‘gallery’ setup. A lot of the content I was unfamiliar with since I only know my family’s particular history, so I found it quite educating. I especially enjoyed watching the oral history videos. Next to the main permanent exhibit was a temporary gallery space. 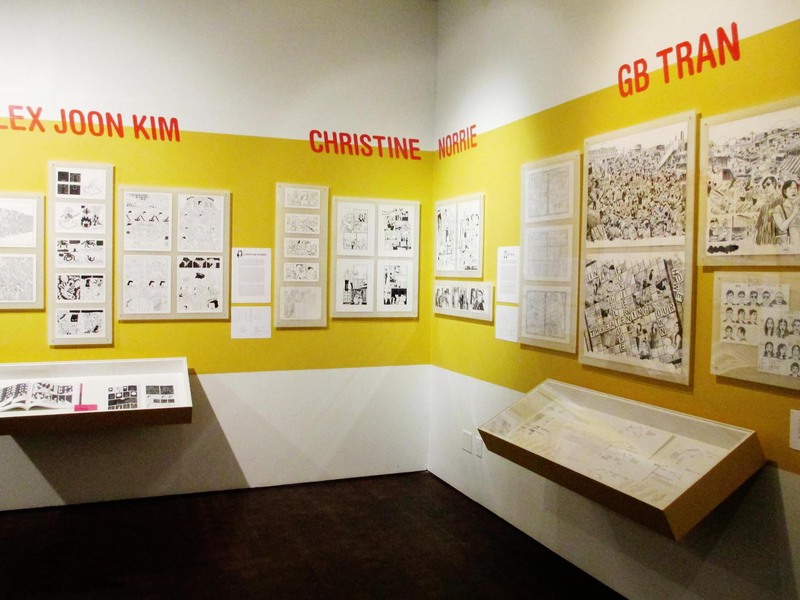 The exhibit up right now (until February 24) is actually two linked exhibits, “Marvels and Monsters” and “Alt.Comics,” which are both about Asian-Americans and comics. I actually found it really interesting and I liked the exhibition design, which incorporated aspects of comic book design. This space was much more of a typical ‘gallery’ feel – nicely lit, white walls. My only quibble is with the installation of the exhibit because some of the wall text was peeling and overall it just lacked some finesse. It’s a pretty small museum but it’s a good one to visit if you have any interest at all in the Chinese-American experience. MOCA has free admission on Fridays, which is great because even though it was a nice visit, I don’t think I would’ve been willing to pay full admission price considering how small the place is. In April they’re going to have an exhibit about fashion which looks to be interesting. But definitely try and go while the comics exhibit is still up! Today is Chinese New Year in the lunar calendar, marking the start of the year of the snake according to the Chinese zodiac. It also marks the start of two weeks of celebration! But to be honest, I’ve never done the full celebrations because I can’t remember what each day means and … that’s a lot of effort. In Chinese culture it’s tradition to put up these red banners around the doorway with phrases of good will or what-not. However, when you’re not in China, it just looks tacky. I was in Flushing (aka “the other Chinatown”) with some friends a few weeks back, so I bought a little token for the new year that I’m hanging on the doorknob to my room. 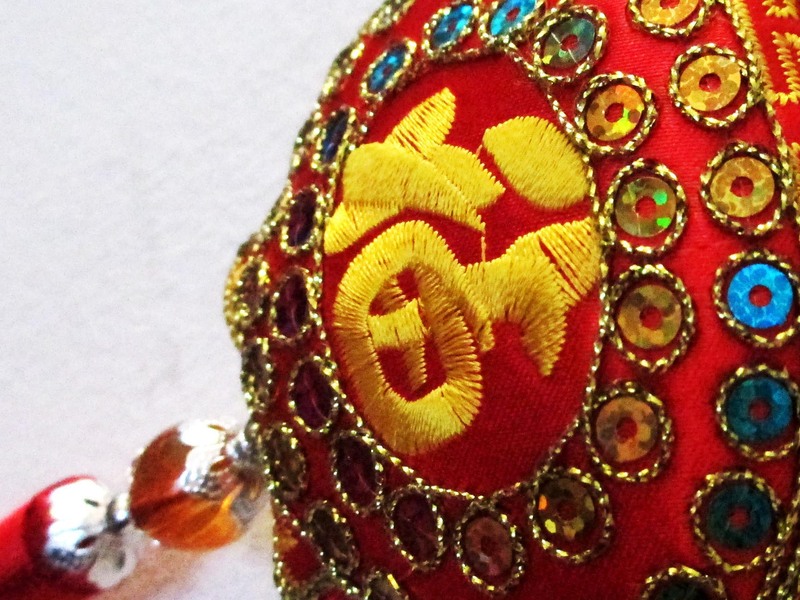 The character embroidered in yellow is 福 (fú), which translates to “good fortune.” It’s commonly seen on Chinese New Year decorations, because everyone’s wishing that the new year brings good fortune. And ya know, I could always use a bit of fortune. snow again – for realz! Today, New York City was snowing her little head off. Woo! It’s been all over the news; these are supposedly “blizzard conditions” … but not really – at least not in Manhattan so far. When I left for work this morning it was snowing (sideways), when I got to work it was sleeting (sideways), when I actually started working it was raining (sideways). My temporary desk faces the window, so I was watching stuff fall (sideways) from the sky all day. Kind of hard to concentrate! No one wanted to go out for lunch so we ordered some pizzas and ate together at the big conference table, which was nice. Then the rain suddenly turned into snow! It was snowing! And it kept snowing! And then I left work. It was still snowing, but … ew. Dirty slushy slippery snow ain’t great to walk around in. It’s still snowing and it’s supposed to continue through the night, so I wonder what it’s going to look like when I wake up. 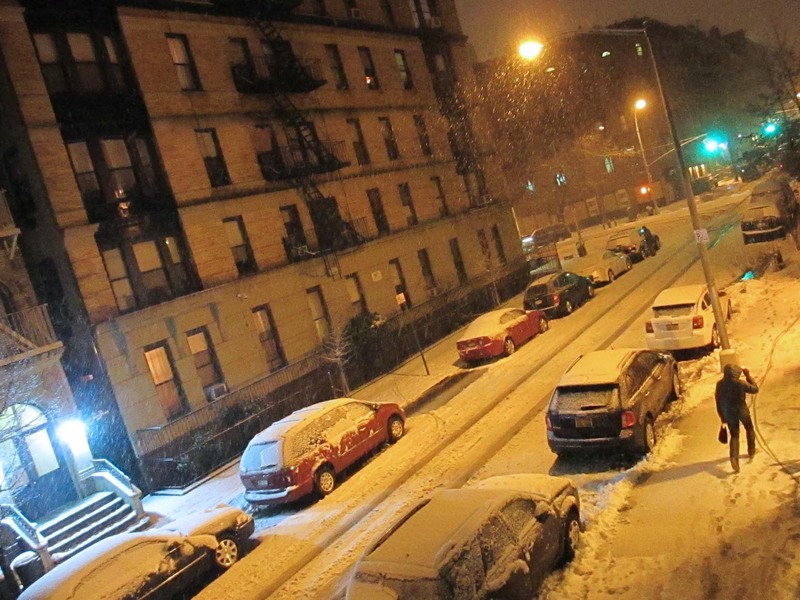 Right now there’s only about an inch on the ground because all the sidewalks had been heavily salted since yesterday. As much as I hope there’s a lot of snow, tomorrow morning I need to head to campus and then trek over to Queens, so that might not be a very fun trip. 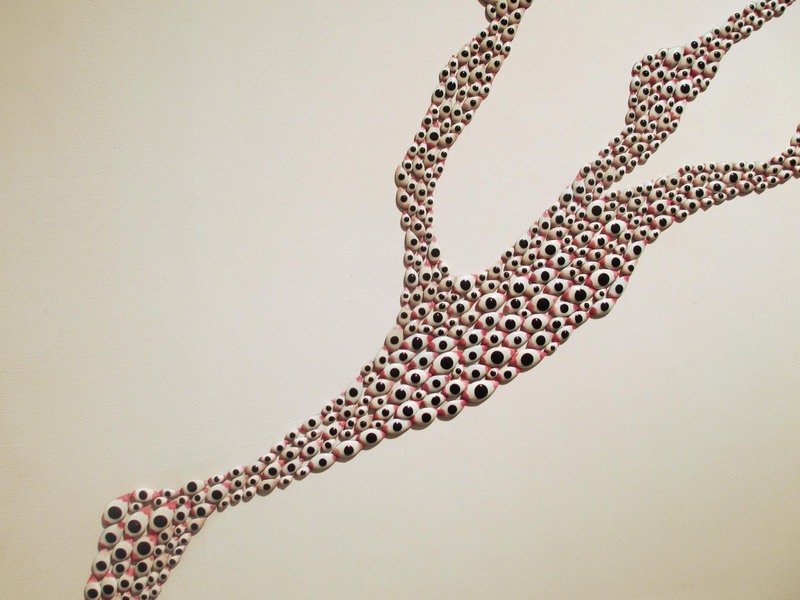 When I was in Mumbai I took in the “eye, etc.,” exhibit (which will run until March 09, 2013) by Anita Dube. She’s an Indian artist who was initially an art historian/critic before crossing that line. The exhibit is at the Lakeeren Gallery in Mumbai’s Colaba district, which is trying to become an artsy district like Chelsea. The exhibit was composed of a few installation pieces that were clusterings of eyes glued to the walls in weird shapes. Kind of creepy, kind of cool. It was surprising to turn around and find a cluster of eyes growing from a corner of the space. The Lakeeren Gallery is fairly small and tight, which put the exhibit at a disadvantage. The gallery is a long rectangular shape, but not perfectly so. You enter at the end of one long wall; on the adjacent short wall was the exhibition description and on the short far wall was my favorite piece. 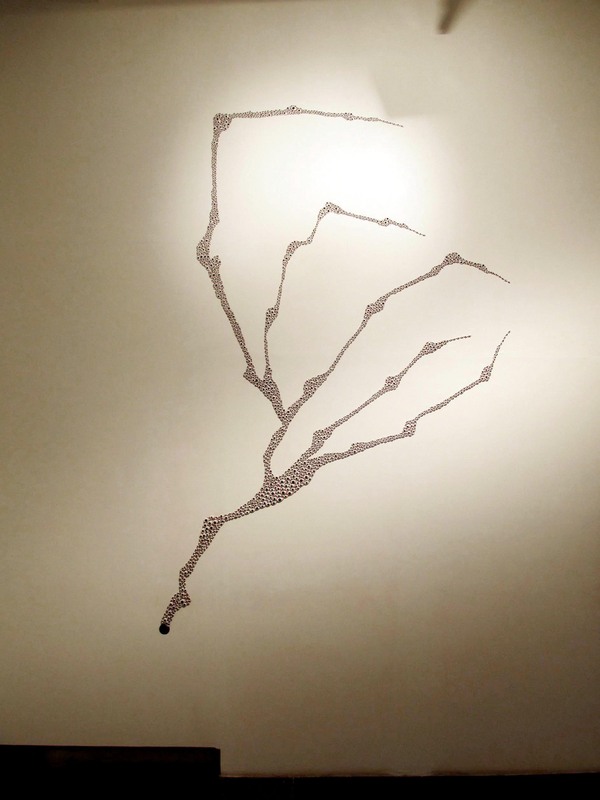 Called “River Disease (Version 2),” this piece basically looked like a claw made out of eyes. 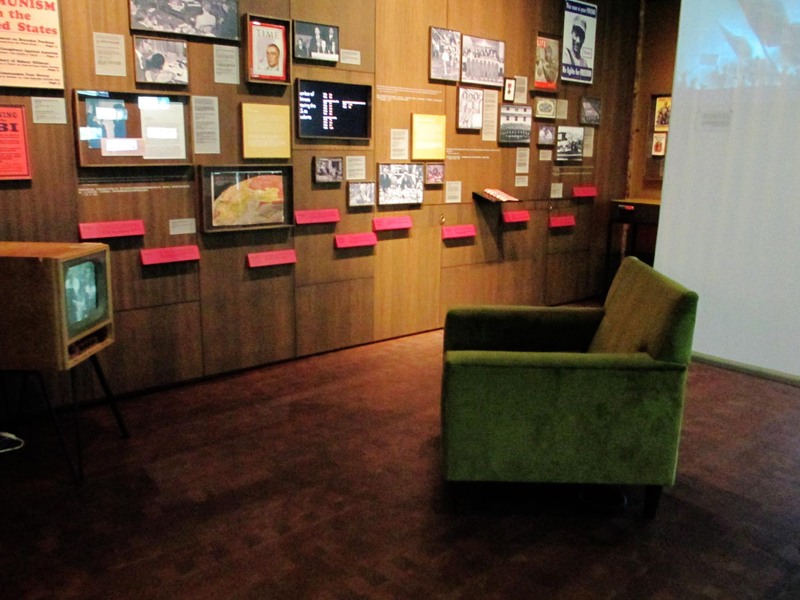 The worst part of the exhibit was the way it was fitted to the space. The eyes were cool, but the irregular space was … irregular. It’s an old building, so they did what they could, but it would have been nice to see some of the pieces that were on the long walls from afar instead of from oblique angles or up close. The lighting was quite annoying as well. It wasn’t very even, which could have been intentional, but it was distracting. And since the individual eyes were fairly low-relief little beads, it was all a bit two-dimensional. This flatness was only somewhat broken by the installations in corners … but a fold according to an existing fold is still surface, so it wasn’t as dynamic as a CLUSTER OF EYES could’ve been.